Amazon loves talking about Alexa. And those are just prepared statements from Bezos. In yesterday’s earnings release, for example, the word “Alexa” appears 31 times, more than “Prime” (30 times), and as many times as “AWS,” the abbreviation for cloud engine Amazon Web Services, if you exclude all the times that AWS is cited in Amazon’s financial tables (Alexa, not being her own revenue segment in Amazon’s reporting, doesn’t get such a privilege). Amazon’s eagerness to promote Alexa is telling, even as other parts of its business put forward strong results. 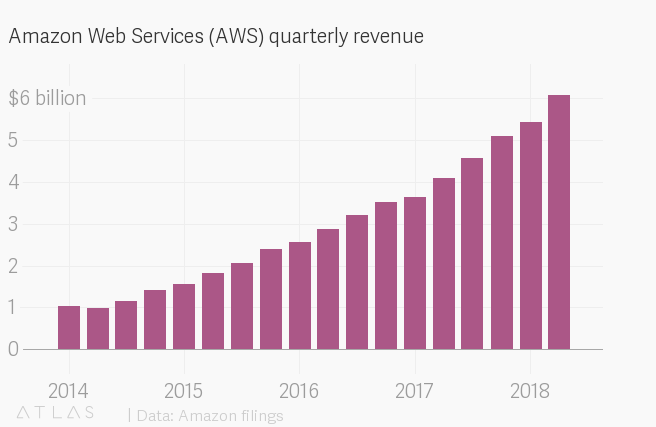 For the most recent quarter, for example, Bezos could just as well have highlighted AWS, which brought in $6.1 billion in revenue for the three months ended June 30, up 49% from the same period a year earlier. Or, he could have pointed to the record-setting profit Amazon made, which, at $2.5 billion, was a whopping 1,200% better than the $197 million in profit it reported for the second quarter of 2017. But he chose Alexa, because Alexa—not Prime, or AWS, or any other part of its business—is Amazon’s current darling. Prime remains a key pillar of Amazon’s business, contributing to $3.4 billion in subscription services revenue in the second quarter, but it’s becoming old news. 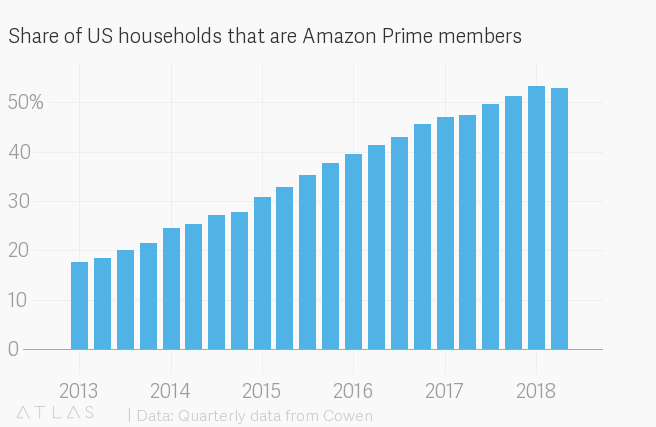 It’s been more than two years since Bezos laid out the goal of making Prime “such a good value, you’d be irresponsible not to be a member,” and, indeed, more than half of US households are now Amazon Prime subscribers. AWS remains a faithful contributor to Amazon’s bottom line, having carried the company’s performance in many quarters as it pumped resources into Prime and other offerings. Revenue from cloud services has grown steadily for the last four years, even reaccelerating over the last three quarters. But it’s Alexa and Amazon’s associated line of Echo products that are new, exciting, and quite possibly the lynchpin of the company’s future. Unveiled in late 2014, the Echo was initially a sleeper hit. Now, technology giants from Google to Microsoft to Apple are racing to own the next generation of personal computing, which they all seem to think will involve devices that speak to each other and humans using artificial intelligence. Alexa is in the lead and Amazon intends to keep it that way. Already, Alexa can tell you the traffic and weather, order an Uber, suggest dinner recipes, add to your grocery list, and place orders on Amazon, among many other “skills.” Some of these things are gimmicky, to be sure, but they help clarify the future Amazon envisions—one in which your first stop for a task or question, before even your smartphone, is Alexa. It’s becoming clear that Alexa, like Prime, makes its users into better Amazon customers. A recent report from analysts at investment management firm Cowen found that 35% of Echo owners made a purchase directly through their device in the second quarter, up from 33% in the second quarter of 2017. The majority of Echo owners also say they interact with the device multiple times a day, giving Amazon as many chances to engage with them. Perhaps most exciting for Amazon is that Alexa still has plenty of room to grow. 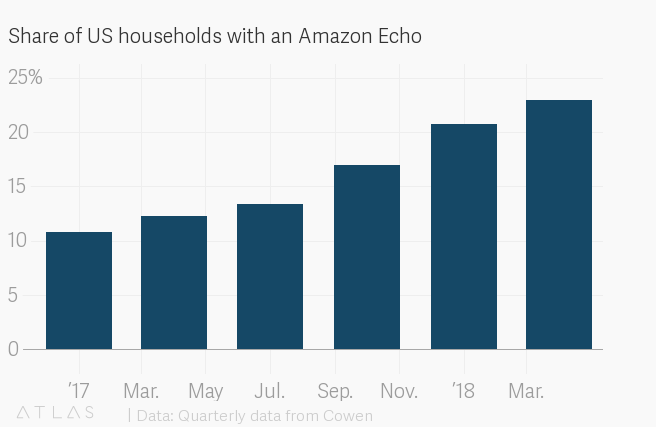 The same report from Cowen estimated that 23% of US households had an Amazon Echo device as of June 2018, based on a survey of about 2,500 US consumers. That number is likely even higher now, as Amazon offered steep discounts on many Alexa-enabled devices during its Prime Day sales bonanza earlier this month. That leaves lots of runway in the US alone for Amazon to get the Echo and other Alexa devices into the hands of existing Prime members and other consumers. 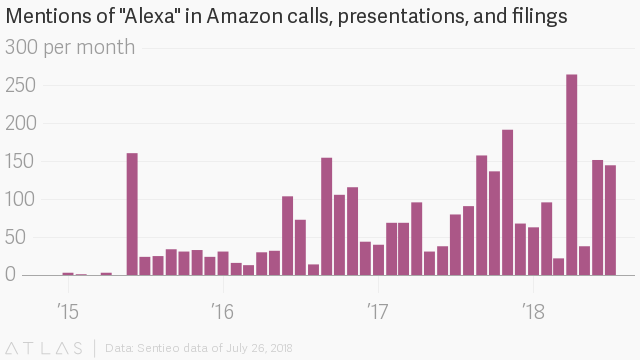 Internationally, Amazon launched the Echo and Alexa in France in the last quarter, and announced they would come to Italy, Mexico, and Spain later this year. The company said the number of Alexa-enabled devices has tripled in the last year, to more than 13,000 “smart home” devices from over 2,500 brands. Amazon is happy to sell you an Echo, but what’s most important is that you’re bringing Alexa into your home, office or car. “Right now our emphasis is around expanding the reach of Alexa and the usefulness,” Amazon chief financial officer Brian Olsavsky said on the company’s earnings call on July 26. Amazon wants Alexa devices to be so useful, you’d be irresponsible not to be an owner.